SKF Timing Belt Kit Water Pump For Audi A3, A4, A6 1.9TDI 2.0TDI Cambelt Set. Only fits engine codes ASZ, ATD, AVB, AVF, AWX, AXR, BKE, BRB, BMM, BPW, BRC, ANU, AUY, VW19NPD, VW19PPD, ASZ, AUY, BVK, BRT, AVF, BEW, BSW, BVF, BGW, BHW, BVH, AVF, BEW, BVF, BGW, BVH. Will not fit the 2.0 16v TDi engine. SKF introduced the timing belt kit concept to the automotive aftermarket over 20 years ago. Today, SKF continues to lead the way with the most complete kits and the industry's best timing belt kit coverage - over 90% of the foreign and domestic vehicles on the road. 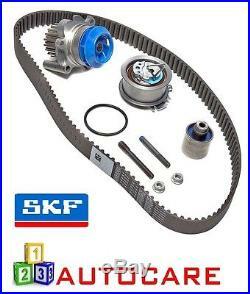 Every SKF timing belt kit comes with all the necessary components to complete a timing belt system installation including belts, tensioners, idlers, seals (camshaft and timing cover), water pump where required and detailed instruction sheets. When performing a timing belt replacement, it is recommended to replace all the parts of the system to avoid individual component failure, unwanted comebacks and additional maintenance costs. New premium quality water pump that meets or exceeds the OE specifications, features a high flow design that provides maximum performance and a long service life. Supplied for trusted UK supplier. We are dedicated to ensuring the highest possible quality service to our customers. Our dispatch warehouse take great care and attention to ensure every package is carefully packaged and labeled and ready for dispatch in a timely manor. All orders are processed usually within hours of the order being confirmed, they are processed and packed and ready to leave us in the first available post. We use only reliable couriers to ensure your order gets to you in a perfect condition, and on time. Should you return the item please remember to include your user name and item number with the item so we can deal with it promptly. The item "SKF Timing Belt Kit Water Pump For Audi A3, A4, A6 1.9TDI 2.0TDI Cambelt Set" is in sale since Wednesday, November 23, 2016. This item is in the category "Vehicle Parts & Accessories\Car Parts\Engines & Engine Parts\Belt, Pulley & Tensioner Kits". The seller is "123_autocare" and is located in United Kingdom. This item can be shipped worldwide.